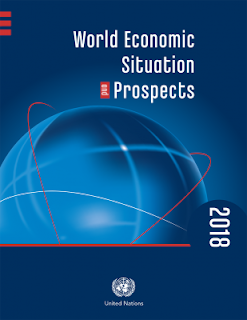 World economic situation and prospects 2018 Report PDF: An upturn in the global economy—now growing by about 3 per cent—paves the way to reorient policy towards longer-term issues such as addressing climate change, tackling existing inequalities and removing institutional obstacles to development, according to the United Nations World Economic Situation and Prospects (WESP) 2018, launched on 11th December 2017 in New York. “The World Economic Situation and Prospects 2018 demonstrates that current macroeconomic conditions offer policy-makers greater scope to address some of the deep-rooted issues that continue to hamper progress towards the Sustainable Development Goals,” stated UN Secretary-General António Guterres in the Foreword. Indian Economy: According to ‘World Economic Situation and Prospects 2018’ report, India’s GDP growth is projected to accelerate from 6.7% in 2017 to 7.2% in 2018 and 7.4% in 2019 on the back of strong private consumption, public investment and the ongoing structural reforms. The report, which was unveiled by United Nations Department of Economic and Social Affairs (UN DESA), stated that overall, economic outlook for South Asia is seen largely favourable and steady for the short term, notwithstanding significant medium-term challenges. On India, the UN DESA report has projected a positive outlook despite the slowdown early this year and the lingering effects of demonetisation.